Jefferson Chapter #300 held its annual Installation of Officers on Oct. 16. Kathy Krol was installed as Worthy Matron of Jefferson Chapter, and Dale Mayer was installed as Worthy Patron. Other officers installed were Roberta Evans (Associate Matron), Larry Mayer (Associate Patron), Ruth Barlett (Secretary), Helen Henson (Treasurer), Betty Hoppes (Conductress), Nicole Cook (Associate Conductress), Larry Schriver (Chaplain), Mark Hoppes (Marshal), Susie Mayer (Organist), Jennifer Hines (Adah), Jacqui Montgomery (Ruth), Cathy Templin (Esther), Mimi Garringer (Martha), Penny Johnson (Electa), Kathy Schriver (Warder), and Beth Babb (Sentinel). Jefferson Chapter #300, of Jeffersonville, received a “Chapter Excellence Award” on Sept. 29 at the statewide meeting of the Grand Chapter of Ohio, Order of the Eastern Star, held in Sandusky. The award recognizes chapter excellence in the areas of charity and community service, chapter social activities, performance of chapter officers and communications. Jefferson Chapter #300 was one of 71 Ohio Eastern Star Chapters recognized as part of the organization’s “Chapter Excellence” awards program, and one of just 34 chapters to receive the silver “Chapter Excellence” award. Jefferson Chapter #300 was the only chapter in District 23 to receive an excellence award. There are nearly 200 Eastern Star Chapters in Ohio. Award winners are selected by state officers and committee members of the Grand Chapter, who review reports submitted by the chapters. It is the fifth year that Jefferson Chapter #300 has received statewide recognition for its programs, activities and overall excellence. The chapter has also previously received recognition for its ritualistic work. The chapter’s charities include donating to local scholarships, Special Olympics, Christmas children’s programs, cancer projects, dyslexia centers, and hurricane relief efforts. The awards were presented by Worthy Grand Matron Sandy Herman and Worthy Grand Patron David Sexton during ceremonies at the Kalahari Resort Conference Center. Susie Mayer of Jefferson Chapter #300 accepted the award on behalf of the chapter. Jefferson Chapter #300 held its annual Installation of Officers on Oct. 16. Kathy Krol was installed as Worthy Matron of Jefferson Chapter, and Dale Mayer was installed as Worthy Patron. Other officers installed were Roberta Evans (Associate Matron), Larry Mayer (Associate Patron), Ruth Barlett (Secretary), Helen Henson (Treasurer), Betty Hoppes (Conductress), Nicole Cook (Associate Conductress), Larry Schriver (Chaplain), Mark Hoppes (Marshal), Susie Mayer (Organist), Jennifer Hines (Adah), Jacqui Montgomery (Ruth), Cathy Templin (Esther), Mimi Garringer (Martha), Penny Johnson (Electa), Kathy Schriver (Warder) and Beth Babb (Sentinel). Kay Richard of Heber Chapter #62 served as Installing Officer, and Milly Beth New of Waverly Chapter #99 served as Installing Marshal. The Order of the Eastern Star is the largest fraternal organization in the world to which both men and women may belong. The organization was created in the United States in the early nineteenth century to allow women to join with their Masonic relatives in promoting the values and charitable purposes that are such an important part of the Masonic fraternity. The organization is open to women, 18 years of age or older, who are related to Masons in good standing. Male members of the order must be Masons in good standing. For more information, please visit the Jefferson Chapter #300 web page at http://www.ohiooes.org/chapter-webs/459-jefferson-chapter or the OES Jefferson Chapter #300 Facebook page. 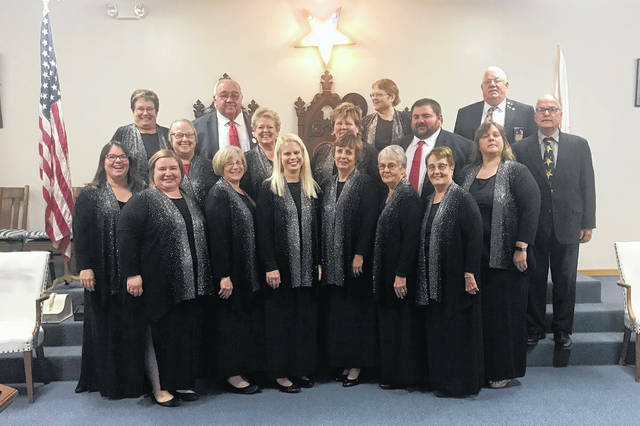 https://www.recordherald.com/wp-content/uploads/sites/27/2018/12/web1_2018-2019-OES-Jefferson-Chapterofficers.jpgJefferson Chapter #300 held its annual Installation of Officers on Oct. 16. Kathy Krol was installed as Worthy Matron of Jefferson Chapter, and Dale Mayer was installed as Worthy Patron. Other officers installed were Roberta Evans (Associate Matron), Larry Mayer (Associate Patron), Ruth Barlett (Secretary), Helen Henson (Treasurer), Betty Hoppes (Conductress), Nicole Cook (Associate Conductress), Larry Schriver (Chaplain), Mark Hoppes (Marshal), Susie Mayer (Organist), Jennifer Hines (Adah), Jacqui Montgomery (Ruth), Cathy Templin (Esther), Mimi Garringer (Martha), Penny Johnson (Electa), Kathy Schriver (Warder), and Beth Babb (Sentinel).